You Can Make 1,000 Kids Smile! You’ve seen the pin. You’ve wondered how you can get one. If you have one, you wear it with pride. And it always puts a smile on your face. 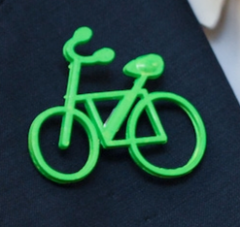 You can help Bike for Life Moscow share the joy with 1,000 local kids this year by helping us purchase 1,000 bicycle pins. The pins come in an assortment of fun bright colors (green, yellow, orange, pink). So far we’ve raised $150. $50 more and we can buy 500 pins. But with all the events that we’ll be participating in this year–such as Bike Fest, Bike to Work Day and the Officer Newbill Kids Safety Fair–we expect the demand will be closer to 1,000 pins. If we raise another $200, we can buy 1,000 pins! We need to place an order this weekend to get them in time for mid-April when the festivities start. Donations of any amount can be made via the Palouse-Clearwater Environmental Institute (PCEI) online at http://www.pcei.org/payment/. Or you can write a check to PCEI and deliver it to the PCEI Nature Center at 1040 Rodeo Drive in Moscow. Be sure to note in the comments field or the memo field of the check that the donation is for bike pins. Please make your gift by Friday, March 22! Questions? Call Jen Hiebert at 208-882-1444 or email jen@pcei.org.